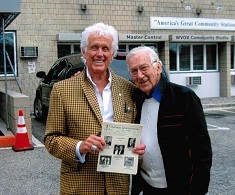 October 15, 2013 - Lou Schwartz, ASA President and former President of the Finger Lakes Broadcasting Corp., met with his old friend Bill O’Shaughnessy, President of WVOX Radio, at his station office in New Rochelle, NY, to discuss the ASA’s “Vet2Broadcasting” program. The program is designed to capitalize on the knowledge, experience and established national network of ASA broadcasters and media production professionals. It will provide returning veterans with a structured orientation and practical training in the production of television or radio sports, news or entertainment programming. The ASA has joined the Wounded Warrior Project, a veterans service organization that offers a variety of programs, service and events for wounded veterans of the military actions following the events of 9/11, to implement this pilot program. The goal of this program is to train the veterans so he/she will be equipped to seek meaningful employment upon completion.